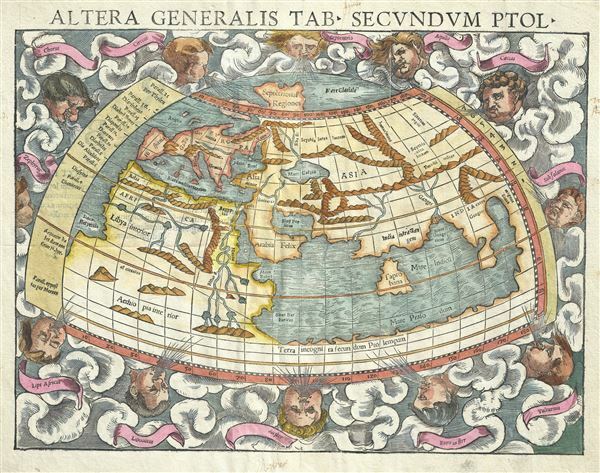 An attractive c. 1550 example of Sebastian Munster's map of the world according to Claudius Ptolemy. The map details the world prior to the great age of discovery. As such, it covers only the 'Old World' from the Atlantic (Pillars of Hercules) to Indochina and from the Arctic to the Equator. The map is surrounded by classical illustrations of Aiolos, or wind heads, among clouds. This map might be hard to understand from a modern perspective. Ptolemy was a second century A.D. geographer established at the library of Alexandria. He compiled a list of cities and coordinates, as well as geographical descriptions of the known world, in an influential work entitled the Geographia.Although no actual maps from Ptolemy remain, it is presumed that he made them. The Geographia did however survive and Renaissance cartographers embraced it not only as a geographical model but also as a reference to the classical texts they were unearthing. It is the Ptolemaic vision of the world we see illustrated here. Europe is easily identifiable in the upper left. Africa becomes a massive continent seemingly without end. It is however defined by two great river systems, the Niger, extending form the Atlantic, and the Nile. Arabia and the Persian Gulf are clearly recognizable. The Indian Ocean is entirely enclosed. Tapobrana, in the midst of this great sea, is mostly probably the island of Ceylon or modern-day Sri Lanka, here oversized due to its importance in the classical spice trade. India, appearing amorphously just to the north, is undersized by comparison. Further east a territory called India Extra Gangers (India beyond the Ganges) is in fact Southeast Asia and the Malay Peninsula. The map extends only so far south as the Equator as Ptolemy believe that as one traveled south they entered an impassible 'Tepid Zone' inhabited only by monsters. By the time this map was made cosmographers like Munster were well aware that the world was much larger and more complex than Ptolemy ever imagined. Columbus had discovered America, Magellan circumnavigated the Globe, and Bartholomeu Dias and Vasco de Gama rounded Africa. Nonetheless, the influence of Ptolemaic geographic was so extreme that in served as the basis for most contemporary maps and was included in its purer from in most atlases and cosmographies of the period. This map was first published in 1540 Cosmographia by Heinrich Petri. Subsequent editions of the Cosmographia appeared in 1541, 1542, 1534, and 1552. All examples of the map from these editions are identifiable by a fine vertical cracking running through the right side of the map through Tapobrana. All have Latin text on verso. Sebastian Münster (January 20, 1488 - May 26 1552), was a German cartographer, cosmographer, and a Hebrew scholar. Münster was born at Ingelheim near Mainz, the son of Andreas Munster. He completed his studies at the Eberhard-Karls-Universität Tübingen in 1518, after which he was appointed to the University of Basel in 1527. As Professor of Hebrew, he edited the Hebrew Bible, accompanied by a Latin translation. His principal work, the Cosmographia, first issued in 1544, was the earliest German description of the world. The book proved popular and was reissued in numerous editions and languages including Latin, French, Italian, English, and Czech. The last German edition was published in 1628, long after his death. The Cosmographia was one of the most successful and popular books of the 16th century. It passed through 24 editions in 100 years. This success was due to the fascinating woodcuts (some by Hans Holbein the Younger, Urs Graf, Hans Rudolph Manuel Deutsch, and David Kandel). Munster's work was highly influential in reviving classical geography in 16th century Europe. In 1540 he published a Latin edition of Ptolemy's Geographia, also with illustrations. The 1550 edition contains cities, portraits, and costumes. These editions, printed in Germany, are the most valued of the Cosmographia. Münster also wrote the Dictionarium trilingue in Latin, Greek, and Hebrew and composed a large format map of Europe in 1536. In 1537 he published a Hebrew Gospel of Matthew which he had obtained from Spanish Jews he had converted. Most of Munster's work was published by his son-in-Law, Heinrich Petri (Henricus Petrus), and his son Sebastian Henric Petri. He died at Basel of the plague in 1552. Heinrich Petri (1508 - 1579) and his son Sebastian Henric Petri (1545 – 1627) were printers based in Basel, Switzerland. Heinrich was the son of the printer Adam Petri and Anna Selber. After Adam died in 1527, Anna married the humanist and geographer Sebastian Munster - one of Adam's collaborators. Sebastian contracted his son-in-law, Henricus Petri (Petrus), to print editions of his wildly popular Cosmographia. Later Petri, brought his son, Sebastian Henric Petri, into the family business. Their firm was known as the Officina Henricpetrina. In addition to the Cosmographia, they also published a number of seminal other works including the 1566 second edition of Nicolaus Copernicus's De revolutionibus orbium coelestium and Georg Joachim Rheticus's Narratio . Munster, S., Cosmographica, (Basel) 1550. The Cosmographia was first issued by Sebastian Munster (1488 � 1552) in 1544. It is considered the earliest German description of the world. In order to produce the Cosmographia Munster put out a call to scholars throughout Germany for cartographic information. The response must have been impressive, especially with regard to far off destinations, for it enabled Munster to compile a work of unprecedented scope and accuracy. The volume proved to be one of the most popular and enduring volumes of the 16th century, appearing in some 24 editions over the next 100 years. The Cosmographia typically consisted of six volumes, each dedicated to a different part of the world. The final edition was issued in 1628, long after Munster himself had passed on. Very good. Expert centerfold reinforcement. Latin text on verso. Shirley, Rodney W., The Mapping of the World: Early Printed World Maps 1472-1700, #76.